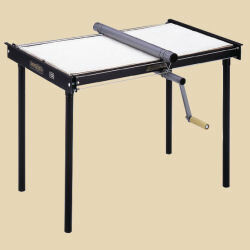 Portable yet extremely sturdy, this slab roller is compact enough to fit on a table. It's ideal for small projects, but may not work as well for production or school use. Solid steel frame and cable drive system of the full-sized SRC. Includes one 1/4" shim with canvas and two plain 1/8" shims. Maximum slab dimensions 14"w x 15"l.
Measures 31"w x 26"L x 14"h fully assembled. Georgies price does not include freight or delivery charges to your location. Shipping weight is 63 pounds. 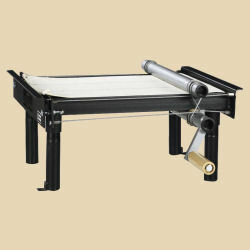 A durable, mid-sized slab roller for the serious potter with limited studio space or for educational clay programs. Includes slab table & leg assembly. Includes one 1/4" shim with canvas, four 1/4" plain shims, and one 1/8" plain shim. Maximum slab dimensions 21"w x 40"L.
Measures 40"w x 51"L x 40"h fully assembled. Georgies price does not include freight or delivery charges to your location. Shipping weight is 207 pounds. 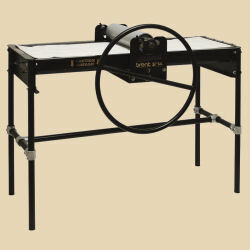 The portable SRC can be set on a table for use, or attach the legs to use it freestanding. The legs are included in Georgies' package price for this model. Measures 27"w x 52"L x 40"h fully assembled.